Our visit this time brings back some of the regular dishes we used to order whenever we come here. Volcano Ramen, one of their “infamous” concoctions. The usual thick ramen noodles in thick tonkotsu broth with 2-3 pieces of char siew, wakame, half an ajistuki tamago (hard-boiled egg flavoured soaked in dark soy sauce), cabbage, spring onions and of course, a heap of minced pork in very spicy “豆瓣酱” fermented soya bean paste. 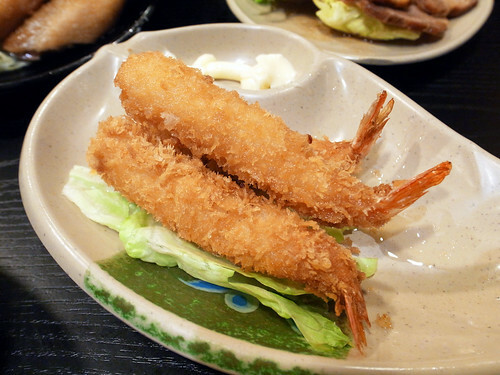 We have “fond” memories of this dish. While I craved for the “kick”” from the hot and fiery sensation that developed when downing the noodles , I often get the runs after reaching home. Much like a love-hate relationship if you ask me. There were times when I hoped the heat would be less poignant and more manageable. Having not tried this dish for quite some time now (at least over the last 2 years), it seems to have become less fiery and somewhat more subdued than before. No more fire-breathing antics I guess. Set meals often come with a side dish of your choice from a list (which is ever shrinking, unfortunately) but this plate of char siew came as an ala carte order. At 3 bucks for 5 pieces, one can hardly complain, compared to the non-descript shreds some ramen joints in town are serving. 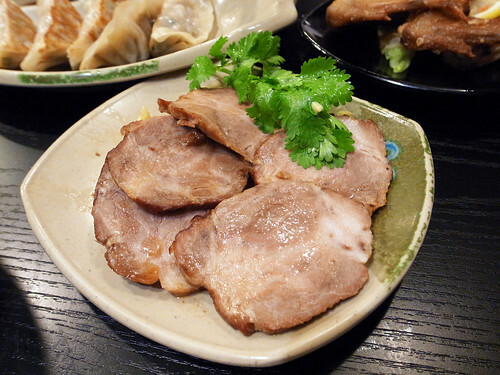 The stewed pork slices, though somewhat thick and firm, were rather cold. Nevermind that ‘cos a quick soak into the soup quickly warms them up. Tonkotsu onsen! 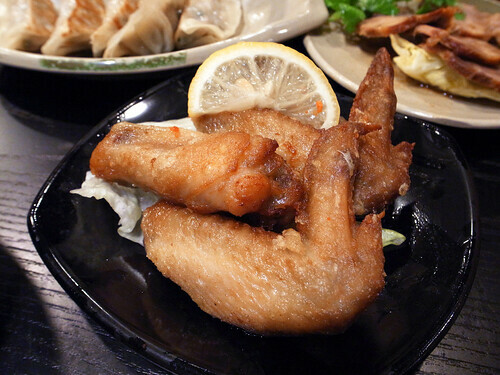 Fried Chicken Wings we chose as a side order with one of the ramen sets. Not too bad actually. A bit spicy and zesty from the slice of lemon included. 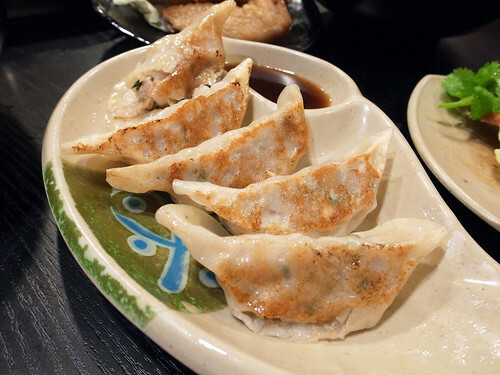 Gyoza on promotion! 5 pieces for $2.90. They are not fantastic but beat those from Nantsuttei hands down, anytime! 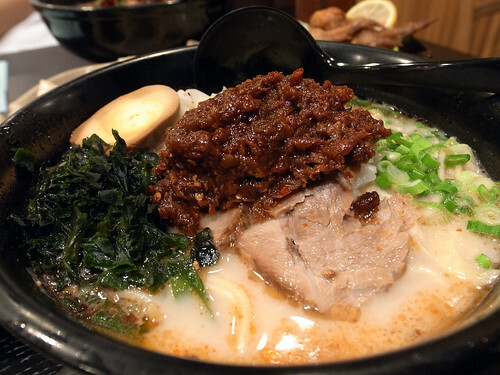 Ajisen Ramen is a typical ramen joint,offering no-frills ramen and accompanying side dishes at rather reasonable prices. 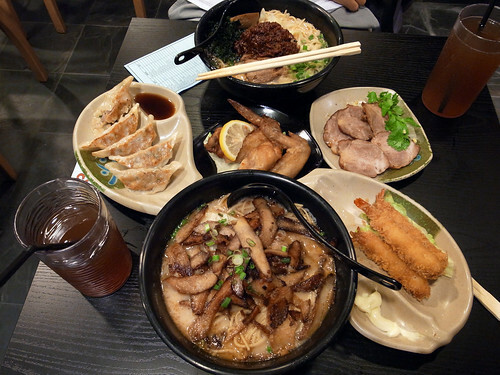 It’s a place where family and friends gather for a bowl of hot noodles in thick tonkotsu soup amidst the shopping at Parkway Parade. The menu has changed considerably over the years (rice sets and some side order dishes were taken out) and so have the prices (escalated quite a bit, especially those we enjoyed 😦 ). Despite the hike and menu revamps, prices remain affordable and despite the invasion of ramen joints over the recent years, I believe Ajisen would remain competitive and a major player in the local Japanese food industry. This entry was posted on October 3, 2010 by Alan (travellingfoodies). 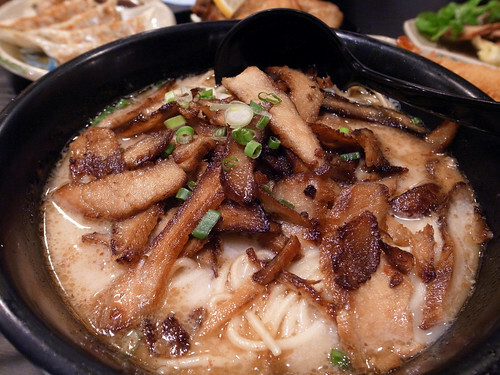 It was filed under Food and was tagged with Parkway Parade, Singapore.